Widely recognized as the best phablet on the market today, Samsung expands their Galaxy Note series into its fourth generation with this morning’s announcement of the Galaxy Note 4. First and foremost, the Galaxy Note 4 advances what we love most about phablets by officially creating the highest smartphone resolution available today at 2,560 x 1,440, reports Mashable. Not only is its resolution top-notch, but the “manufacturers claim it has benefits for color and contrast” as well. Apple may even be moving toward larger smartphone screens, a trend that New York Times says Samsung started with its first Galaxy Note (even if the size of the Note 4 did not actually exceed the size of Note 3). With all of the new Note’s features, we bet you’re just as excited as we are to get your hands on the latest Samsung Galaxy gadget. You can bet our mighty slim cases for Note 3 like StyleBook and the military-grade protective CandyShell Grip have been some of our most popular phablet cases. 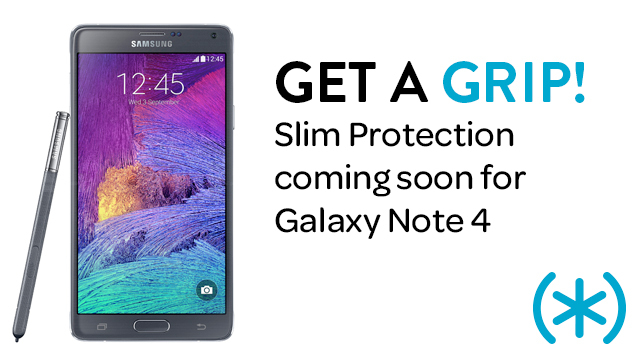 Now just wait and see what we’ve got in store for the Galaxy Note 4.